This wonderful family home is the perfect 'home away from home' for you and your family. Spacious and comfortable, Glaze Meadow Homesite #239 is a large 2,209 sq. ft. With three king bedrooms and a bedroom with a queen and twin, it is a great home for two families or couples. 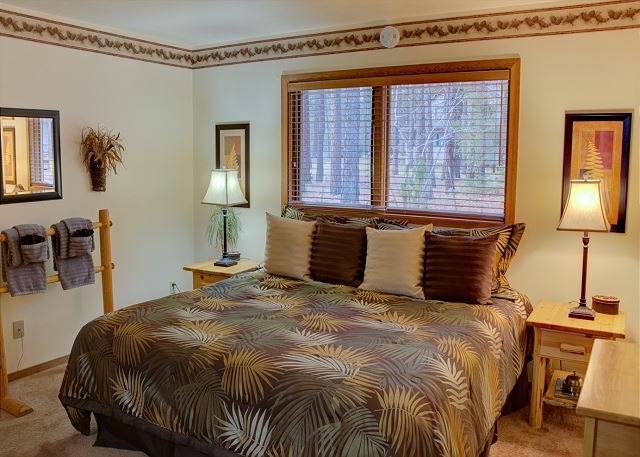 There is one king bedroom off the entry which uses the downstairs bathroom.The bathroom doubles as a laundry room with a large capacity washer and dryer. The kitchen, dining room and kitchen all have beautiful hardwood floors and are light and bright with the many windows on the south side. The kitchen is fully equipped and all the appliances are newer and state of the art. The dining table sits 6 with 2 bar stools at the eating bar. The living room is also light and bright and has comfortable leather furniture and a large wood-burning fireplace for those cooler summer evenings or winter getaways in the snow. Lodge decor and artwork add to the ambiance of the experience. Upstairs is a large master suite with king bed. Down the hall is another king bedroom and a bedroom with a queen and a twin bed. They share the small bathroom in the hallway. Other features you will enjoy at this home are wireless broadband internet, partial air conditioning, three televisions (living room, downstairs king and upstairs master), large decks for those evening BBQ's or lazing in the sun, and the close proximity this home is to the Glaze Meadow Recreation Area. The back deck is very private and deer are often seen grazing nearby. You and your family and friends will love the large outdoor dining table with umbrella a comfortable cushions. You will love this home and come back again and again for your special Ranch vacation. Around the circle out front . Nice and flat for the beginner bikers! Al in all it was a wonderful week in Black Butte! We had a good time at this home with our kids and their families. Everyone had enough room to spread out and grandma could be on the first floor. Kitchen wa swell appointed Would have liked to have more bikes to use and to have use of the hot tub which was locked up. We usually have a hot tub in sunriver and black butte rentals. But the pool and trails were nice. The house was very clean and comfortable; the location was good. I would rent this house again. I think it should be noted there are several sets of stairs to the main living area and master on the main floor. My father doesn't do stairs well and we were excited to find a home that had a master on the main, but he had a hard time with the stairs to and from the bedroom/living/kitchen area. Also, no bikes was kind of a disappointment. Being dog friendly was a big plus. Overall we had a nice stay and the property managers were very nice and responsive. The home accommodated five adults, three children and two dogs very nicely. This is the first home in the six years we've rented at Black Butte that has had air conditioning and it is was much appreciated on the smokey days from the wildfires. The home was well equipped with extra supplies like laundry soap, trash bags, hand soap etc. I brought my own along after past experiences of not having enough in other rentals (not Howells') and didn't need them. Also appreciated all the dog supplies and the eclipse glasses. We all enjoyed watching the eclipse along with all the other residents. Luckily we had a clear day and had a great view from the golf course. As usual the grandkids had fun riding their bikes and swimming. relaxing and we liked that the house was away from other houses. i might suggest to get some bee traps. they were making nests up in the eaves. 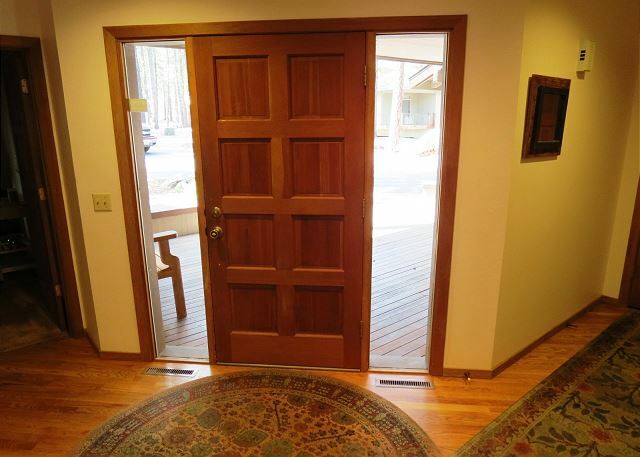 Absolutely excellent in every way...the rental was superb...a lovely house; Black Butte Ranch is a great family friendly place with wonderful amenities...could not have been better overall. House fills our needs well. It needs some care but is in a quiet neighborhood looking off to the woods. We had to bring the BBQ to deck as well as all outdoor furniture. Inconvenient.